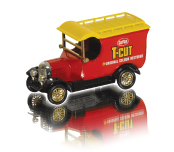 Tetrosyl Group is 60 years old and that means the iconic T-Cut brand is celebrating its Diamond Anniversary. Peter Schofield Chairman of Tetrosyl said “After 60 years and tens of millions of tins sold, T-Cut is so iconic it’s virtually a verb. To remove scratches or clean paintwork most people say ‘ Just T-Cut It ‘”. In these days of manufacturing decline, we are proud to have been producing T-Cut in the UK since 1954 and will continue this tradition for generations to come. T-Cut is also used around the home for cleaning and restoring uPVC, acrylic and porcelain bathrooms, kitchen appliances, brass and metal objects, to name but a few. T-Cut Metal Polish is a new addition to the T-Cut family. This product contains a unique formula that will cut through any surface corrosion and oxidation and will protect it against tarnishing and discoloration leaving the surface with a brilliant shine and lustre. The T-Cut product range has been increased over the years with new product introductions to compliment modern vehicle paintwork such as metallics and pearlescent paints. Tetrosyl has used both innovation and modern technology to create totally new products like T-Cut Color Fast, a colour enriched cleaner and wax that removes scratches, deepens the colour and restores the lustre, all in one. This is a concept Tetrosyl launched on National Television in 1998. This product is the number 1 selling line in most automotive outlets. Over recent years, this concept has been extended with the launch of T-Cut Colored Scratch Remover Tubes…Another first on the car care market! The advertising slogan may have changed over the years, ‘T-Cut, the original and the best’ to ‘If it says T-Cut it works’, however the logo has remained the same since 1954.